Can Kurt Austin and NUMA save the world’s oil? 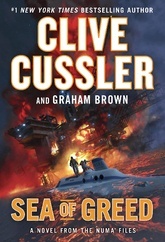 After an explosion in the Gulf of Mexico destroys three oil rigs trying to revive a dying field, the trail leads Kurt Austin and the NUMA Special Projects Team to a brilliant billionaire in the alternative energy field. Her goal is the end of the oil age; her company has spent billions developing the world’s most advanced fuel-cell systems. But is she an environmental hero…or a rogue genetic engineer? The NUMA crew discovers that bacteria are consuming the oil before it can be pumped out of the earth—a bacteria lost decades ago when two submarines vanished in the Mediterranean. With hired killers on his trail, can Kurt Austin locate a submarine hidden for more than fifty years? And can the biological terror be stopped?